A few days ago I blogged about the fanatical and largely incorrect religious people who have co-opted real religion in order get people to support the idea that our civil laws should be based on their rather absurd and selective religious beliefs. I also mentioned that I felt sorry for those truly religious people whose beliefs were being co-opted and misrepresented. “Why do the people who rail on about tolerance not tolerate anyone or anything not in agreement with their views?” Irrelevant, as tolerance does not mean you have to accept everything. “You don't hate all Jews, just Israel". Totally irrelevant. “Just as we have to tolerate collectivists, feminists, Jew haters, statists, dhimmis, and militant sodomites” which led to a discussion about Gay people and their rights, but had nothing to do with the topic. “Of course the writer is not "anti-religion," he is certainly anti-Christian, though". The implication being that all Christian beliefs are legitimate and all Christian believe the fanatical things. “Hypocrite and fanatic of course meaning someone who dares to disagree with him". Obviously an oversimplification to avoid examining the facts. There was even the equating of the Secretary of State using a jet to do diplomacy with religious people who tell their congregations that they must tithe or God will reject them, while they have the jets and fancy homes bought with those tithes. I can only assume people did not actually read the blog, but simply assumed it was anti-religion as opposed to anti-fanatic, or, and I hope this is not the case, many of the commentors actually support the wing-nuts and will perform whatever intellectual and verbal gymnastics it takes to do that. So, let me offer some examples of what I mean by religious fanaticism that is bought into by people who cannot tell the difference between actual religion and the politics of those who have something to gain by misrepresentation. if these get any defense, it will be hard to take many commentors seriously from this point on. There is the darling of the Tea Party, her name to go unmentioned, who claims that the laws of the United States should be based on the Bible. Unfortunately, if that were the case, her daughter would have to be stoned to death for having a child out of wedlock, as would her husband have to be stoned to death as he allowed her to have held political office, thus lording it over men while being a woman, and for letting her speak to large crowds in an authoritative manner. A Right-Wing 'Christian' group is making death threats against President Obama on Facebook. The group, Christian American Patriots Militia, says on its Facebook page, “We now have the authority to shoot Obama, i.e., to kill him." “The 2nd Amendment gives us the right and duty (authority) to engage an enemy of the United States that does so with the design to reduce us under absolute despotism. I would be very surprised, if Obama does not leave Washington DC today (Nov 19) and never return, if he is not dead within the month. Please join us at Christian American patriots Militia”. This group already has over 1,400 acknowledged followers who, obviously, have their own FB friends with whom they share posts, which, means there are a lot of people who see what this group promotes. Some might feel compelled because of the Christian angle, to actually do something. Such a threat is a felony, and an actually really stupid one to make on Facebook since that reduces the chance of deniability. People have notified Facebook of this page and have made the appropriate complaints, and federal agencies are watching. Making any arrests now would just make self-declared martyrs out of these people, so, sadly as of now, they have to be watched and arrested only upon the commission of assassination. 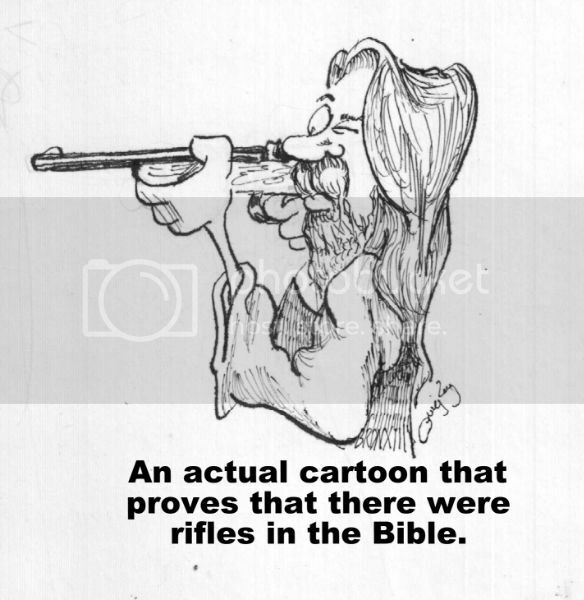 Larry Pratt, the Executive Director of Gun Owners of America recently not only claimed he found the existence of guns in the Bible, but warned Americans who didn’t own guns that God was “judging” unarmed Americans while “blessing” the gun owners. Speaking at an Oklahoma Second Amendment Association breakfast sponsored by the Tulsa 912 Project earlier this month (and I can attest from experience that this would be a very receptive audience who holds religion as a powerful force in their lives and government, and hold the Bible as inerrant), Pratt claimed that gun control laws are a sign that “we will know we are under God’s judgment". Using the Book of Samuel he pointed out that, because of sinfulness, only two men had swords at the time the Israelites were attacked by an enemy without warning, as if the ancient Israelites went around fully armed at all times. So if we want God’s blessing we must be packing heat. But what of those who chose not to strap a gun on? “If we are walking around like they are in New York and San Francisco, we are under his judgment,” he said. These two examples were particularly useful with the audience he was addressing, as San Francisco is the Oklahoma example of licentiousness, the new erroneously name Sodom,and new York City the most crime ridden city in the world. Every time someone is killed in Oklahoma, even as it is one of the top 5 places for gang killings, and while it leads the country in other types of murders, many locals make the moronic statement, “This is the type of thing you expect in new York City, but not here”. But, I am sure there will be those who will defend these examples which are only three of many more. In our complaining about Muslims and defending the attitude that all Muslims are extremists and terrorists, people have asked why, if they are not all extremists, we do not hear from the moderates. Wouldn’t that hold true for Christians as well. Instead of finding ways to excuse them, or distracting from the fact that they exist and have influence, why do the "good Christians" not only find ways to excuse them, but do not speak against them?